Has your car been in an accident? By utilizing state-of-the-art painting systems, our auto paint shop can make your Tumwater, WA car look brand new again. Lakewood Auto Body has invested in a cutting-edge computerized color matching system, and has the latest tools and equipment to ensure auto painting work with an industrial finish. Our auto paint shop has the experience and expertise to repair chipped paint in your vehicle and prevent moisture-related damages from occurring. By keeping our costs at a minimum, our auto paint shop can help even Tumwater vehicle owners own a shiny, new car without spending a fortune. Accidents happen. When they do, count on our auto paint shop to restore your Tumwater vehicle back to its pre-accident condition. If the paint of your vehicle has been compromised due to a collision, we are your go-to auto paint shop in the Tumwater area. No matter how major or minor the damage, our car painting service can restore the integrity of your vehicle. Your auto painting work will be performed by an ASE certified technician who will treat your vehicle with respect and care. Our technicians are trained to complete the auto painting job on your Tumwater vehicle quickly and efficiently. Because we want you to feel fully satisfied with our services, we offer a lifetime warranty on all our car painting work for Tumwater vehicles. Custom auto painting is our specialty. We can restore your car or truck back to its original beauty and shine. Not only do we restore your vehicle, we also restore your desire to drive your ride. 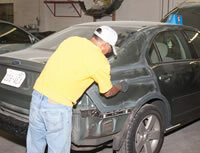 By combining our custom auto painting work with complementary hand detailing, we ensure complete customer satisfaction. To get a quote for car painting cost for your Tumwater vehicle, feel free to give Lakewood Auto Body a call at 253.581.0220.